By Evelyn McCormack, director of communications, Southern Westchester Board of Cooperative Educational Services (BOCES), Elmsford, N.Y.
Is your district one of the many that have invested in electronic media tools but doubt that administrators and teachers are making effective use of what’s available? Has your school system not yet “taken the plunge” into social media? This month’s Leading Off offers a number of helpful suggestions to convince your colleagues of the value of new tools that have become necessary components of a strategic communication program. As business leaders urge schools to prepare students for a changing world economy, administrators and staff of one elementary school are addressing that challenge. A dual language program that includes the teaching of Mandarin Chinese and English to native Spanish speakers, has led to improved academic achievement, increased parental engagement, and national recognition for the school and the district. Learn how school leaders used public relations strategies to make a vision become a reality in this month’s Trend Tracker. NSPRA Front-Runners are members identified by the NSPRA Executive Board as emerging leaders who are doing outstanding work for their schools, their chapters and for NSPRA. Read about Front-Runner Mychal Frost. By Joe Krumm, APR, director, community/government relations, North Clackamas School District, Milwaukie, Ore. In this month’s President’s Corner,Joe Krumm, APR, reminds us of what is most important in our work and our lives as we embrace the holiday season. Stay informed by following NSPRA on Twitter, visiting us on Facebook, or connecting with us on LinkedIn. School PR IS being social, so log in, speak up and share your experiences! Real-time updates, interesting stories and member tips. Seminar Call for Presentations extended, Seminar Scholarships and Scholarship Support, special recognition awards, and more in this month’s NSPRA 411. Research in the communication profession is not abundant, but once in a while a study is completed where NSPRA members can use some of the findings to assess their own practice of PR and to help plan the development of their own careers. In this month’s Always Something, Executive Director Rich Bagin, APR, highlights some of the findings of a world-wide study completed by 4,500 professional communicators. 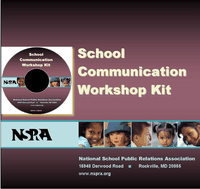 With the updated School Communication Workshop Kit, NSPRA makes it easy to help everyone from principals to teachers to maintenance support staff improve their communication techniques and become effective ambassadors for your schools. Now includes a CD with the original PowerPoint presentation, allowing you to run successful communication workshops. NSPRA’s Complete Crisis Communication Management Manual is a best seller for good reason: school leaders know a crisis can strike at any moment and this manual makes sure you’re ready. Over the years, school leaders across the country have relied on this invaluable resource as a guide to navigate the treacherous communication challenges that a crisis presents. When a crisis strikes, the first 30 minutes are the most crucial. See the table of contents and order now! The NSPRA eNetwork is published monthly, except July, by the National School Public Relations Association, 15948 Derwood Road, Rockville, MD 20855. © 2012 National School Public Relations Association - all rights reserved.